Wow did I want to love these. Who doesn’t like rainbows? They must taste wonderful! 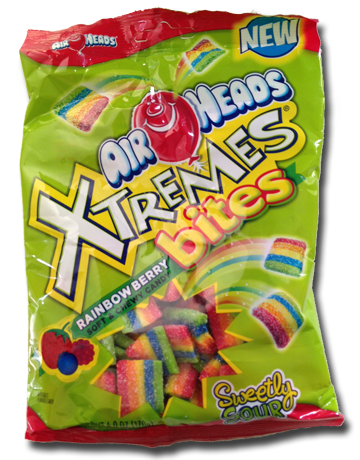 Since my love for the fruity pasta tends to lean to “the maybe a bit weird” side, my eyes and taste buds assumed I’d have a similar affair with the Airheads Extremes Bites Rainbow Berry. Alas, mine eyes and taste buds deceived. Us Gurus like the Airheads. The flavors of their longer taffy “sticks” are pretty good with a real tang to them. 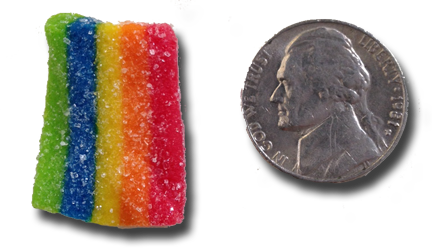 Some candy companies might even call it “sour” (though they shouldn’t). Still, Airheads are oft o’erlooked and we say nay – Nay! They should not be! They don’t have the tang of the original. The sour sugar coating isn’t sour enough. The bright aroma of the just-ope bag doesn’t apply to the candy AT ALL. It’s all very general tasting…sure I guess it’s berry but what the hell is berry? Raspberry is very different than Blue or Straw. We All Know This. I wish the darned candy companies would get more specific with flavors. Do strawberry wrong, Mr. Wonka, if you must, but TRY to do it. The general berry is a cop out. …so there was a lot to eat in the bag. Also, the candy had the right thickness to it and the right kind of chew, though I probably should have seen if the fridge would have made them tougher. Leave these on the shelf and go tried and true Airheads instead. I was JUST gonna buy these and review. Thank you for doing Yeoman’s work. Namaste. I love them. A lot. Well I love that you love them. A lot. They have a weird texture. Like flaky and airep bubble gum. 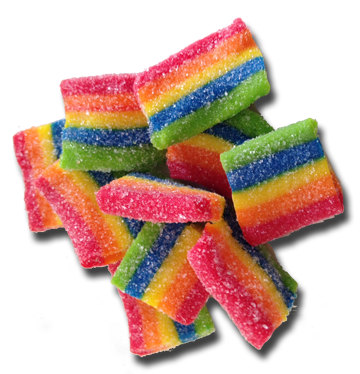 These are one of my favorite candies, but they have changed.when I first enjoyed them, each of the individual color “strips” were perforated. In other words, you could kind of break them off one by one as you ate them. I guess it’s cheaper to just make them as 1 piece now because that’s all you can find now. Anyway, I do like them. The perfect punch of tanginess and sweetness creating a blast of flavors in the mouth. I also found several places to buy Sour Belts, but the Rainbow Berry kind is a little trickier to find. I found this on http://www.bonvera.com/join/product/AE073390008376 and rightly it’s my favorite pick for the season. I love them,iam so addicted. I have a question…. Are the colors different flavored? i don’t think so. Maybe… I didn’t eat them that way. I should try them that way though. and I will! I will say, that even though I didn’t love these, the colors and packaging always make me want to buy them.